A little dull just reading through summaries of everyone’s routines, but it was cool to see how different famous people whose work I like worked. Lots of drugs, alcohol, bad habits, but also strong routines and rituals. To maintain his energy and concentration, the poet relied on amphetamines, taking a dose of Benzedrine each morning the way many people take a daily multivitamin. At night, he used Seconal or another sedative to get to sleep. when he wasn’t painting, Bacon lived a life of hedonistic excess, eating multiple rich meals a day, drinking tremendous quantities of alcohol, taking whatever stimulants were handy, and generally staying out later and partying harder than any of his contemporaries. Bacon depended on pills to get to sleep, and he would read and reread classic cookbooks to relax himself before bed. Beauvoir rarely had difficulty working; if anything, the opposite was true—when she took her annual two- or three-month vacations, she found herself growing bored and uncomfortable after a few weeks away from her work. His breakfast was coffee, which he prepared himself with great care—he determined that there should be sixty beans per cup, and he often counted them out one by one for a precise dose. before coffee could be served, Levin had to select which cup and saucer he preferred that day, and then, bizarrely, justify his choice to Kierkegaard. All those I think who have lived as literary men,—working daily as literary labourers,—will agree with me that three hours a day will produce as much as a man ought to write. But then, he should so have trained himself that he shall be able to work continuously during those three hours,—so have tutored his mind that it shall not be necessary for him to sit nibbling his pen, and gazing at the wall before him, till he shall have found the words with which he wants to express his ideas. Toulouse-Lautrec did his best creative work at night, sketching at cabarets or setting up his easel in brothels. The resulting depictions of fin de siècle Parisian nightlife made his name, but the cabaret lifestyle proved disastrous to his health: Toulouse-Lautrec drank constantly and slept little. Marx relied on his friend and collaborator Friedrich Engels to send him regular handouts, which Engels pilfered from the petty-cash box of his father’s textile firm—and which Marx promptly misspent, having no money-management skills whatsoever. He wrote standing up, facing a chest-high bookshelf with a typewriter on top, and on top of that a wooden reading board. 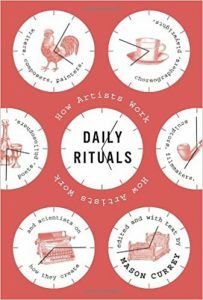 Two or three hours in the morning were enough for him, although he stressed the importance of keeping regular hours in order to cultivate a daily creative rhythm. “I know that to sustain these true moments of insight one has to be highly disciplined, lead a disciplined life,” he said. “The times that I’ve tried that, when I have been in a slump and I try to get out of it by saying, ‘Come on, Ann, sit down at that typewriter,’ I’ve gotten in a worse slump. It’s better if I just let it ride.” As a result, she often won’t write anything for months. The founder of behavioral psychology treated his daily writing sessions much like a laboratory experiment, conditioning himself to write every morning with a pair of self-reinforcing behaviors: he started and stopped by the buzz of a timer, and he carefully plotted the number of hours he wrote and the words he produced on a graph. James was writing from personal experience—the hypothetical sufferer is, in fact, a thinly disguised description of himself. For James kept no regular schedule, was chronically indecisive, and lived a disorderly, unsettled life. Picasso took over its large, airy studio, forbade anyone from entering without his permission, and surrounded himself with his painting supplies, piles of miscellaneous junk, and a menagerie of pets, including a dog, three Siamese cats, and a monkey named Monina. By the 1950s, too much work on too little sleep—with too much wine and cigarettes—had left Sartre exhausted and on the verge of collapse. Rather than slow down, however, he turned to Corydrane, a mix of amphetamine and aspirin then fashionable among Parisian students, intellectuals, and artists (and legal in France until 1971, when it was declared toxic and taken off the market). The prescribed dose was one or two tablets in the morning and at noon. Sartre took twenty a day, beginning with his morning coffee and slowly chewing one pill after another as he worked. She was using sedatives to get to sleep, and when they wore off at about 5:00 A.M. she would get up and write until the children awoke. Working like this for two months in the autumn of 1962, she produced nearly all the poems of Ariel, the posthumously published collection that finally established her as a major and searingly original new voice in poetry. Armstrong never ate dinner before a show, but he would sometimes go out for a late supper afterward or, more often, retreat to his hotel room for a room-service meal or take-out Chinese food, his second-favorite cuisine (after red beans and rice). Then he would roll a joint—Armstrong openly smoked pot, or “gage,” as he called it, nearly every day, believing it to be far superior to alcohol—catch up on his voluminous correspondence, and listen to music on the two reel-to-reel tape recorders that followed him wherever he went. I’ve found over the years that any momentary change stimulates a fresh burst of mental energy. So if I’m in this room and then I go into the other room, it helps me. If I go outside to the street, it’s a huge help. If I go up and take a shower it’s a big help. So I sometimes take extra showers. I’ll be down here [in the living room] and at an impasse and what will help me is to go upstairs and take a shower. It breaks up everything and relaxes me. Writing in bed was the least of Capote’s superstitions. He couldn’t allow three cigarette butts in the same ashtray at once, and if he was a guest at someone’s house, he would stuff the butts in his pocket rather than overfill the tray. Tesla worked best in the dark and would raise the blinds again only in the event of a lightning storm, which he liked to watch flashing above the cityscape from his black mohair sofa. Upon arriving, he was shown to his regular table, where eighteen clean linen napkins would be stacked at his place. As he waited for his meal, he would polish the already gleaming silver and crystal with these squares of linen, gradually amassing a heap of discarded napkins on the table. And when his dishes arrived—served to him not by a waiter but by the maître d’hôtel himself—Tesla would mentally calculate their cubic contents before eating, a strange compulsion he had developed in his childhood and without which he could never enjoy his food. Milton was totally blind for the last twenty years of his life, yet he managed to produce a steady stream of writing, including his magnum opus, the ten-thousand-line epic poem Paradise Lost, composed between 1658 and 1664. Arriving in Sweden, in time for one of the coldest winters in memory, Descartes was notified that his lessons to Queen Christina would take place in the mornings—beginning at 5:00 A.M. He had no choice but to obey. But the early hours and bitter cold were too much for him. After only a month on the new schedule, Descartes fell ill, apparently of pneumonia; ten days later he was dead. When Napoléon III seized control of France in 1851, Hugo was forced into political exile, eventually settling with his family on Guernsey, a British island off the coast of Normandy. In his fifteen years there Hugo would write some of his best work, including three collections of poetry and the novel Les Misérables. Chief among them was an all-glass “lookout” on the roof that resembled a small, furnished greenhouse. This was the highest point on the island, with a panoramic view of the English Channel; on clear days, you could see the coast of France. There Hugo wrote each morning, standing at a small desk in front of a mirror. After reading the passionate words of “Juju” to her “beloved Christ,” Hugo swallowed two raw eggs, enclosed himself in his lookout, and wrote until 11:00 A.M. Then he stepped out onto the rooftop and washed from a tub of water left out overnight, pouring the icy liquid over himself and rubbing his body with a horsehair glove. Townspeople passing by could watch the spectacle from the street—as could Juliette, looking out the window of her room. At noon Hugo headed downstairs for lunch. The biographer Graham Robb writes, “these were the days when prominent men were expected to have opening hours like museums. First, he needed absolute quiet; at one of his houses, an extra door had to be installed to his study to block out noise. And his study had to be precisely arranged, with his writing desk placed in front of a window and, on the desk itself, his writing materials—goose-quill pens and blue ink—laid out alongside several ornaments: a small vase of fresh flowers, a large paper knife, a gilt leaf with a rabbit perched upon it, and two bronze statuettes (one depicting a pair of fat toads dueling, the other a gentleman swarmed with puppies). After trying many schemes, Bucky found a schedule that worked for him: He catnapped for approximately thirty minutes after each six hours of work; sooner if signaled by what he called “broken fixation of interest.” It worked (for him). I can personally attest that many of his younger colleagues and students could not keep up with him. Nevertheless, despite the apparent success of his high-frequency-sleep experiment, Fuller did not stick with it indefinitely; eventually his wife complained of his odd hours, and Bucky went back to a more normal schedule, although he continued to take catnaps during the day as needed. But I’ve never been a night writer, unlike some of my colleagues, and I’ve never believed that one should wait until one is inspired because I think that the pleasures of not writing are so great that if you ever start indulging them you will never write again. So, I try to be a regular sort of fellow—much like a dentist drilling his teeth every morning—except Sunday, I don’t work on Sunday, and there are of course some holidays I take. According to the biographer Anne C. Heller, Rand had spent years planning and composing the first third of her novel; over the next twelve months, fueled by Benzedrine pills, she averaged a chapter a week. The Benzedrine helped Rand push through the last stages of The Fountainhead, but it soon became a crutch. She would continue to use amphetamines for the next three decades, even as her overuse led to mood swings, irritability, emotional outbursts, and paranoia—traits Rand was susceptible to even without drugs. I begin each day of my life with a ritual: I wake up at 5:30 A.M., put on my workout clothes, my leg warmers, my sweatshirts, and my hat. I walk outside my Manhattan home, hail a taxi, and tell the driver to take me to the Pumping Iron gym at 91st Street and First Avenue, where I work out for two hours. The ritual is not the stretching and weight training I put my body through each morning at the gym; the ritual is the cab. The moment I tell the driver where to go I have completed the ritual.